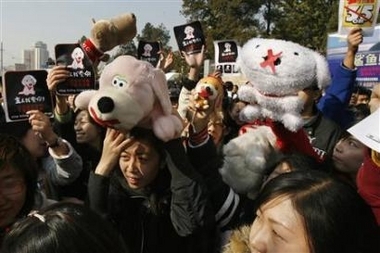 Demonstrators angry over a crackdown on dogs staged a noisy protest in China's capital yesterday, demanding a stop to mass killings to control pet populations. 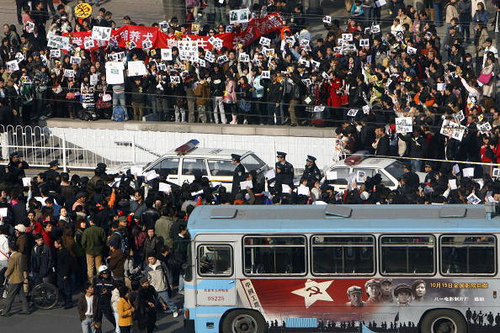 About 200 police kept watch and strung up tape to cordon off the roughly 500 demonstrators, as they held up stuffed animals, waved signs and chanted "Down with Dog-raising Restrictions" near the entrance to the Beijing Zoo. Many wore buttons that said "Respect Life, Oppose Indiscriminate Killing." Though the demonstration was largely peaceful, anti-riot squads in helmets and dark uniforms were dispatched, and protesters gave differing accounts as to whether any demonstrators had been taken away. 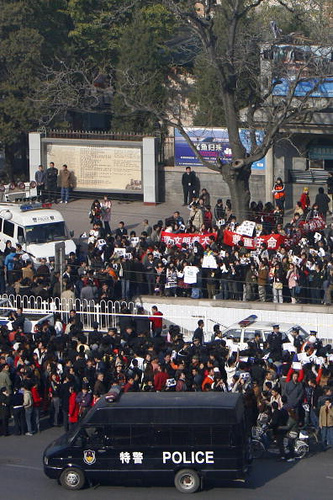 Police used loudspeakers to urge protesters to take their complaints to a special desk set up inside the zoo. Nine representatives of the protesters were taken inside the zoo to discuss the protest with police, protesters said. (South China Morning Post) Crackdown infuriates dog owners. By Jane Cai. 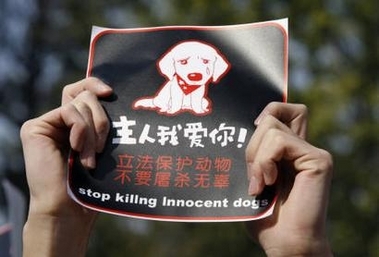 About 500 dog owners staged a protest in Beijing yesterday against the seizure and killing of pets in a crackdown sparked by rabies fears. 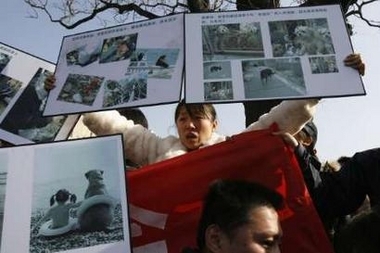 The demonstrators, monitored by about 200 police officers, gathered outside Beijing Zoo waving signs and chanting slogans such as: "Down with dog-raising restrictions" and "Love our dogs, love others for a harmonious society". The protest, organised through internet chat rooms, was to start at 11am, but many angry dog owners arrived two hours earlier. In an effort to disperse the crowd, the police seized several placards and detained 15 protesters, allegedly beating some of them. This further infuriated the crowd, which responded with shouts of "Release the people! 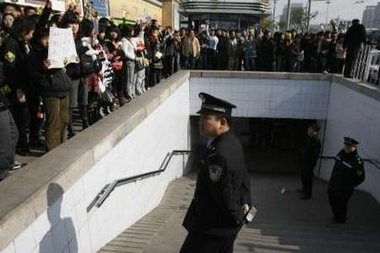 ", attracting passers-by to join the protest. Although the demonstration was largely peaceful, anti-riot squads were sent to maintain order and plainclothes police milled through the crowd. Tearful demonstrators told how their dogs had been seized by police in recent weeks, despite being registered and vaccinated. Last week, the Beijing municipal government issued a circular banning dogs taller than 35cm from nine districts and limiting ownership to one dog per family. Bigger, unlicensed and extra dogs will be confiscated, either to be put down or sent to fostering centres. It also empowered police to go into homes to check and seize dogs, and residential committees to report irregularities. "Is the 35cm limit reasonable? Guangzhou allows 40cm. Who can tell me why dogs higher than 35cm are banned in Beijing? Do we have to be stricter because of the Olympics?" 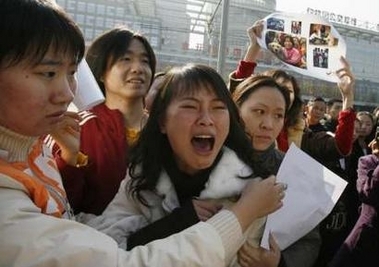 protester Wang Yan said. 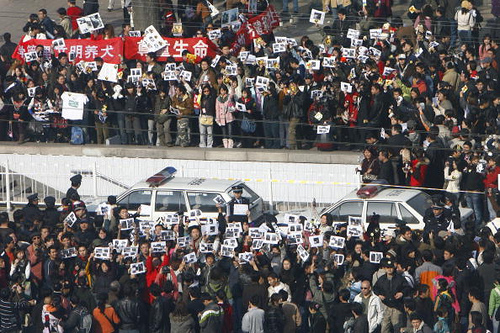 Fellow protester Jiang Ran said: "I've been jittery since the government announcement was made. Whenever I hear a knock at the door, I rush to hide my dog under the bed. I have two dogs. I don't want to give either of them away." 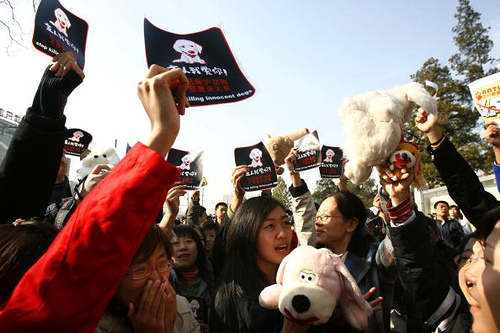 The protesters said they were not against government's decision to better regulate dogs, but the approach adopted by the Beijing government was wrong. "Why can't I raise more than one dog, while the nation raises stupid or corrupt officials? Why can they go to our homes to take away our property?" a man shouted. The crowd yelled: "Down with corrupt officials!" Zhang Luping, a Beijing-based animal rights activist, said her animal protection website www.ani8.com was shut yesterday. Police told her the closure was due to her "leaking state secrets". The protest action was supposed to originally scheduled to start at 11am. But the police were already assembled awaiting orders before 11am. When the first protestors arrived and milled around, the police used man-on-man coverage. After several protestors got on the short wall protecting the trees to chant slogans, the police began to take action. ETTV reporter Lu Bingnong was filming with a small hand-held videocamera, and he was 'invited' to go into the zoo police station where he was interrogated in a small room. He was asked to provide identification. He took out this Taiwan identify card and his reporter's card. The police was going to confiscate them, but he protested and got to keep them. The videotape was removed from his camera and then he was permitted to leave with the camera. 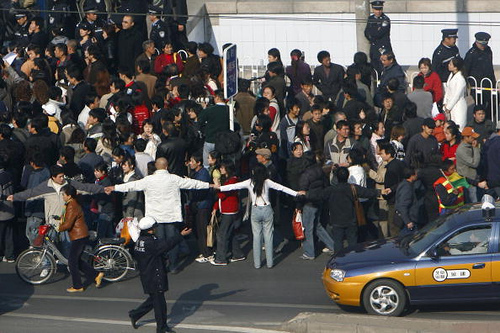 Three local Beijing reporters were arrested. One of them threw a chair inside the police station.